On Sunday, the 19th of October, Ruth and I went to the Nakuru church to visit and to minister. 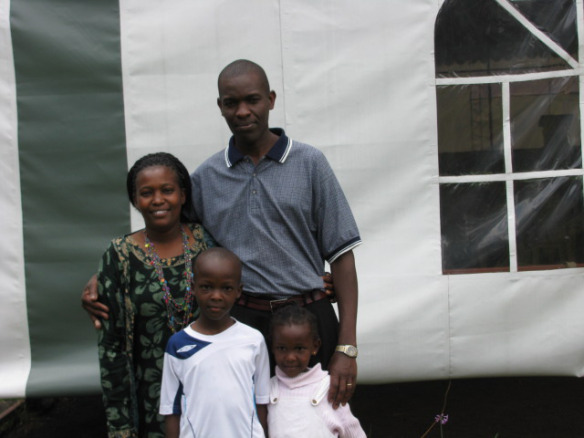 Our Nakuru church was started in October of 2012, by Pastors Tony Wozniak, George Mungai, Joseph Mburia, and their families. The town of Nakuru had been on Pastor Scott’s heart for a number of years. Nakuru is the third largest town in Kenya, as well as being the fastest growing town in the nation. Pastor Tony and Karen Wozniak went back to the States in June of this year. At that time, Pastors Joseph and George became the co-pastors of the church. Both of these men have been with Calvary Temple for over 10 years and have proven themselves faithful in ministry. Ruth and I arrived at the church just before the 10:00 service. In that first service, I shared with the people from 1 Corinthians 12, reminding them that we are placed in the Body of Christ where it pleases Him. In this generation, many people flit from church to church. It is as we allow the Lord to set us where He desires us to be that we can grow and be productive members of His Body. In the second service, I shared from Ephesians 4. We saw that although we each have a personal relationship with the Lord Jesus, it is through the local fellowship and under the ministry gifts that have been placed there that we can grow, mature, and help the local body to increase and be strengthened. 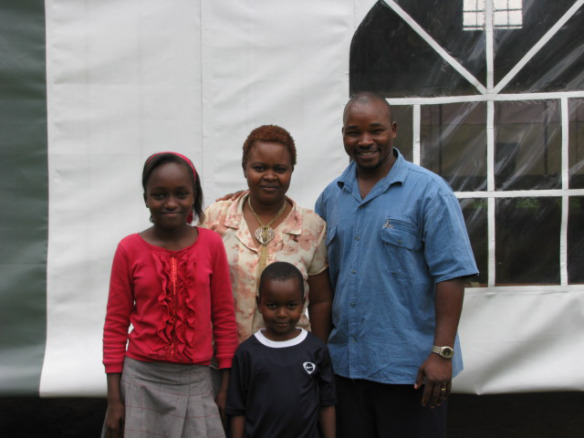 Pastor Joseph Mburia and his family. After the service, Ruth spent some time with the ladies, while I spent some time with Pastor Joseph and the youth group. 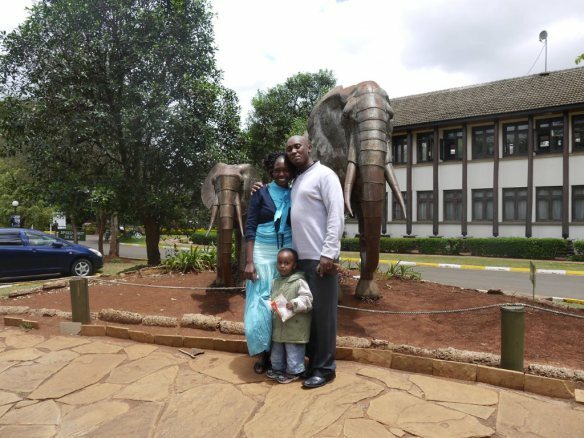 Pastor George Mungai and his family. When we left, we took Pastor George with us to Eldoret, as he had some business to attend to there. We had a very good time of fellowship together. 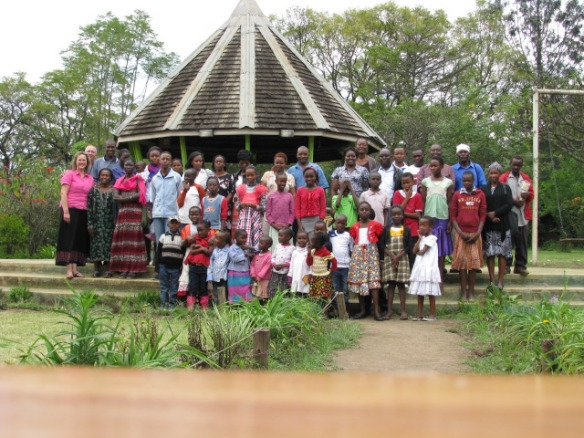 Although the church in Nakuru is small, we are seeing growth in the people’s lives. We are also seeing some growth numerically as the people reach out to their communities. We are thankful for the work that God is doing in our Nakuru Church. This entry was posted in Church Missions and tagged Calvary Temple Missions, Calvary Temple Sterling VA, Kenya, Kenya Missions on October 20, 2014 by Pastor Forbe Carlson. Greetings. We continue to rejoice in Father’s goodness to us, day by day strengthened by His Word and His presence in our lives. My family is doing well in Jesus. I am thankful for Debra’s heart for God; she is truly a blessing to me. From the beginning of the year, Pastor Ben of Umoja has been inviting us to visit the brethren there, to minister to them, and to spend some time in fellowship. For the Eldoret Church and me personally, we are indebted to the family of God in Nairobi. Their love and sacrifice from the start of our church are beyond words. I remember with tears in my eyes the trial we went through several years ago, and how Pastor Ben came and stood with us – a true brother in a time of adversity. I have desired to share our much appreciation to a people who have loved us much. Last Saturday, we had the privilege to visit our family in both Umoja and Kwa Njenga. I was able to minister in Umoja and share our love and appreciation. We spent the whole day in love with the precious people of Umoja, and I was blessed to see what Father is doing and the good work in individuals’ hearts. It was amazing to see how much God has made us part of another, even from one church to another. The next day we spent time with Pastors Ben and Peter. We went with our wives out to a beautiful place called Paradise Lost and had sweet fellowship together. It was a blessing, because Debra and I were very refreshed and built up by both of these men’s marriages. We were privileged to spend the next two days with Pastor Rob and Mildred. They took us out to see the Animal Orphanage, and then to a place called KFC! Wow, now that was good chicken! It was a great time together. It is always a blessing to have time around Pastor Rob. His life and his marriage minister greatly to us. On Wednesday, Pastor Peter took me around the Kwa Njenga Estate. 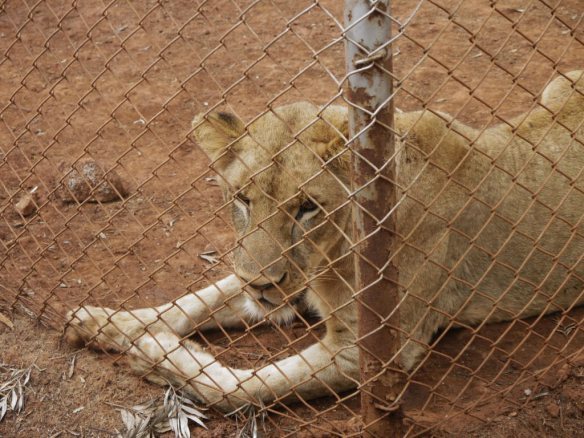 I was blessed, because walking around such a chaotic place, then coming in to their sanctuary, put things into perspective. What a beautiful place of refuge from all the chaos everywhere! I was thankful to see what God Has provided for the ministry there. We had a great time in the worship service with the brethren. Again, I was blessed much by the family of God; we hugged, shared, and enjoyed the Body of Christ in Kwa Njenga. 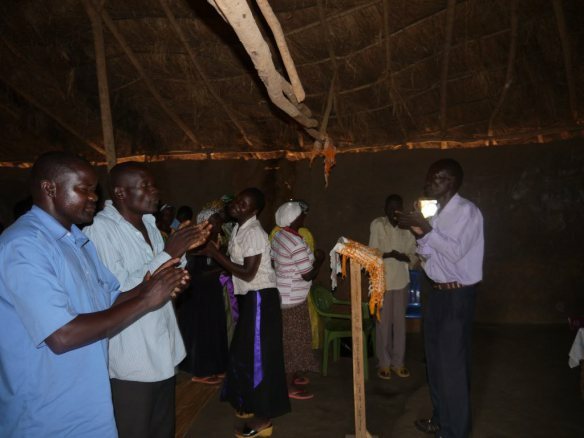 What a great work has been done under the oversight of Pastor Peter! We are so grateful for our time in Nairobi with our Calvary family. What a privilege it is to be part of such a work of God in this generation! This entry was posted in Church Missions and tagged Calvary Temple Missions, Calvary Temple Sterling VA, Kenya, Kenya Missions on October 17, 2014 by Pastor Forbe Carlson. We left Eldoret and travelled to Uganda to visit our churches there. 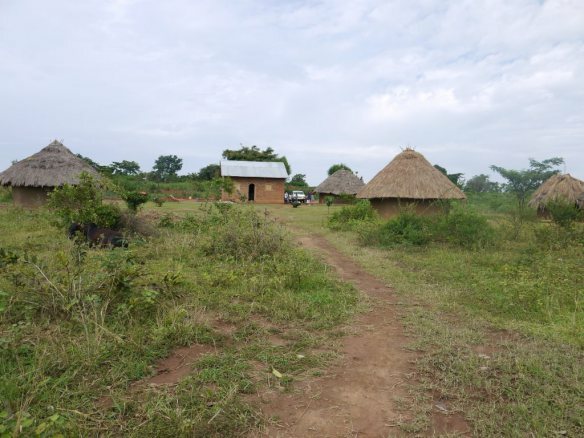 Its about a three hour drive to the border and another hour and a half to Pastor Ogutu’s church on dirt road. Pastor Rob and Mildred with Pastor Joshua Mugabe and his wife. The border town is Busia where Pastor Joshua Mugabe has a church. We were able to stop at his church for a brief time of greeting some of the members of his church and took a meal at him home before pressing on to cross the border. The border is an area of controlled confusion and chaos. It is a blistering hot, dusty, windy place. I don’t think they had seen a white man in weeks and so the border agents descended on us like vultures supposedly to assist us across the border but really to get every shilling that they can squeeze out of you. After about 2 hours of going through various checkpoints and stations we were able to finally escape. Magoli, Uganda. Pastor Ogutu leading a church service. Pastor Ogutu met us at the border to take us to his church. We were warmly received by the people when we arrived on Friday evening, they were very happy to see us. 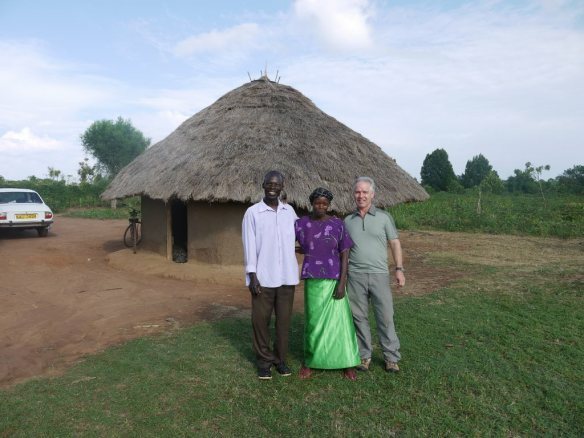 All four of the churches in Uganda are within a few miles of each other so we invited them to come as well. I think these are probably the poorest of the churches that we have here. We stayed with Pastor Ogutu and his family and they took good care of us. Mildred and I did have good time in ministering to them. They were teachable and acknowledge their faults and wanted to honor the Lord. Magoli church. Old church building on right, new building on the left. There were some positives that stood out in our time in Uganda. 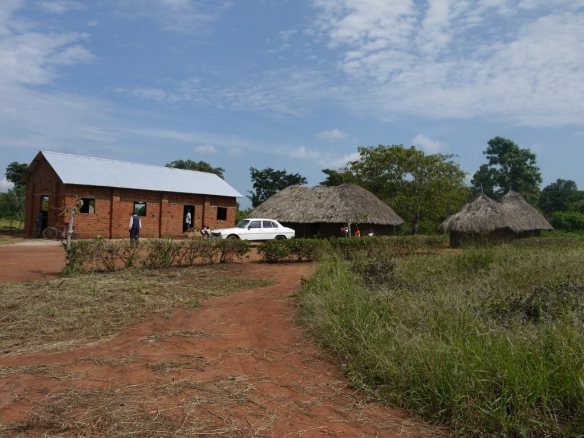 Over the past year Ogutu and his congregation had been able to build a nice building through the giving of the people. Also in our services the people seemed attentive to the word. Pastor Egessa and his wife stood out to us. There was a joy and freedom that was evident in their lives and marriage. At the last pastor’s conference when wives were also there, the Lord touched their marriage. 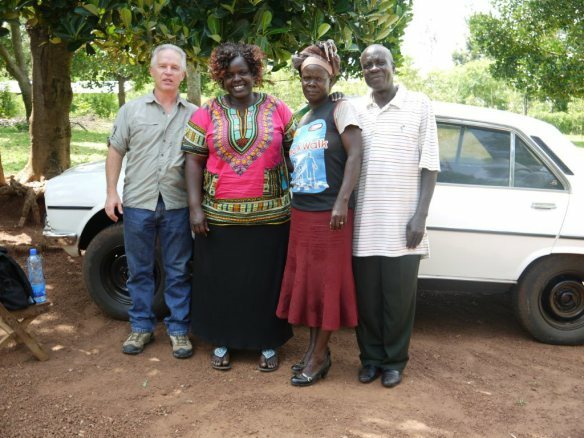 Pastor Rob, with Pastor Ogutu and his wife. Joshua was a great blessing to have on the trip. His servant’s heart and ministry to the pastors and the church was reflective as that of a son in the faith. The Lord really touched him on the trip in the area of returning to first love and helping the marriages in his church. He couldn’t wait to go home and bring these truths to his flock. The one challenge I brought both to these pastors in my time with them and their members was what Jesus said, that your traditions have made the word of God powerless. The fruit will be their response to these challenges. This entry was posted in Church Missions and tagged Calvary Temple Missions, Calvary Temple Sterling VA on October 7, 2014 by Pastor Forbe Carlson.